The top 10 reasons to Invest In Gold Jewelry and escape the fate of Icarus in the financial meltdown follows. 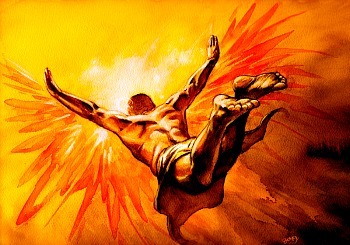 Ignoring instructions not to fly too close to the sun, Icarus, our mythical pioneer with wings of wax, falls to his death. Our pioneer's reliance on his wings made of wax is a nice comparison with our reliance on today's paper currencies. The first reason to invest in gold jewelry, is owing to an increase in luxury consumers. Antique gold jewelry is a luxury item. Luxury consumers buy luxury items. Sixty percent of the world’s population resides in the countries extending from Afghanistan to the micro-states of Oceania. That makes more than one billion new Chinese, Middle-East and Indian Luxury consumers who have a long tradition of buying gold in the form of recession proof, portable, Physical Gold Jewelry. Experience is the mother of wisdom; in the poorest economies of the world, people have come to realise that investing in gold offers more security than fiat money which is only as good as the value one places on it. Take the emerging Asian-Markets and the impact the unprecedented growth will have on the luxury and gold markets in the years to come. Some of the better lab created diamonds are moissanite diamonds. Moissanite didn't come onto the market until 1998, and so closely resembles a diamond that gemstone experts have a hard time telling the two stones apart without a special instrument. Synthetic moissanite diamonds can even fool electric diamond testers by erroneously indicating "diamond". Moissanite sells for about one-tenth the price of diamonds. Diamond imitations have been around for hundreds of years, but nowhere as convincing as the diamond fakes you see around today. Diamond is not the only begotten gemstone to keep you awake at night, wondering if it's faithful to its original natural properties. Read the story about a visitor to this web-site who is trying her hardest to determine if the 40 cts color-change gemstone is authentic alexandrite gemstone or a crafty Siberian imposter. Another one of the top 10 reasons to invest in gold jewelry, is owing to the fact, that if the diamond is the original vestal diamond in your antique diamond jewelry, then smile, simper, smirk & grin, for you have acquired an immortal antique cut diamond in addition to the antique gold jewelry store of value. One of the best 10 reasons to invest in gold jewelry crafted in the days of yore, is on account of its strong track record over time, and we could be talking about hundreds, even thousands of years when referring to antique heirloom pieces. Gold investments such as antique gold jewelry and 20th-century jewelry is a tried and trusted way of investing in physical gold, and has a better track record over time, long term, than investing in stocks, shares, and currency markets. Antique Gold Jewelry has stood the test of time and its performance over time is unmatched. When you invest in Antique Gold Jewelry you have acquired a gold investment that's safer than paper dollars in the current financial crackup. Another one of the top 10 reasons to invest in gold jewelry with age quality is because it's recession proof. Keeping assets in the bank means one gets a paltry interest rate (if that) which gets eaten up with bank charges and inflation as each year the dollar is worth less than the year before. Antique gold jewelry does not hit you with bank charges and is not subject to inflation. With inflationary scenarios, investors need an asset class with a relatively fixed supply that will at least increase with inflation and is likely to attract speculative demand as a consequence. Precious metals achieve this with low annual production in relation to total supply, and converts into currency as fiat currencies lose their value. As for investing in Natural Pearls; - well, don't hold your breath. A strand of Natural Pearls is more rare and valuable than any of the other types of pearls put together, even the black Tahitian cultured pearl members that have recently joined the pearl family. High quality, early vintage black pearls are as rare as hen's teeth. Ounce-for-ounce, Natural pearls are more expensive than gold. Who says so? Christies, that's who. In a recent article, by Layla Haroon, of the City Times, Director of Jewellery at Christie’s, says that Natural pearls, yield a better return than Gold! Now, if you can manage to touch one of the little Natural Pearls from the Persian/Arabic Gulf then count yourself lucky. Another one of our best 10 reasons to invest in gold jewelry is owing to the fact that Antique gold has a higher melt-down price. Most people don't consider the melt-down price, (scrap value) of their Antique gold jewelry, and why would they? Example Gratia, premier Antique Gold Jewelry has a higher retail price above the spot gold price than gold bullion. To stretch the point, take Platinum, a precious metal, popular in jewelry making from the early 20th century. Antique specialists, Ralph and Terry Kovels say: "Old platinum jewelry, the metal popularly used in high-quality Art deco jewelry is more than likely made of metal that's at least 85% platinum." But platinum is very expensive today, as it's one of the rarest elements in the earth's crust and New platinum jewelry may be made of metal that's only, wait for it - 58.5% platinum! Not surprisingly, the New platinum alloy is causing controversy because the hallmarks contain the word “plat” or platinum.” Sounds like another marketing mash-up, if you ask me. When you invest in gold and platinum Antique jewelry your risk of being duped is significantly reduced. Good things come in small sizes and old gold jewelry is one of them. You can wear gold, and you know exactly where your money is when you are wearing it. Gold facts are: Au, or gold, has the periodic number of 79, a boiling point of 2,856°C or 5,173°F, a standard atomic weight of 196.966569 g/mol and is metallic yellow in appearance. On the other hand, the gold market can be extremely shadowy with unsavory characters lurking in murky places attempting to place risky barriers between owners and their gold. There are basically 3 ways of buying gold and when you buy physical gold jewelry you get to see, wear and pet your gold investments yourself. Even if you buy gold antique jewelry, not intended for your own personal use, your investment will be appreciated for their historical value and craftsmanship, and will be increasing in value. The heirloom factor is another one of ten reasons to invest in gold jewelry we chose. 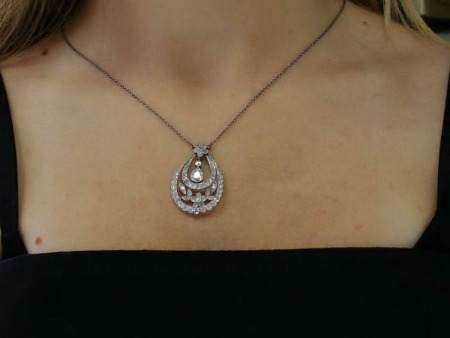 Premier Antique and 20th Century jewelry is the perfect gift between family members. There is no other gift in the world which carries as much sentimental value and shows you care. One of the 10 reasons to invest in gold jewelry from the secondary markets is due to the simple fact that the Jewelry can still be put to its original purpose, which is to complement beauty and fashion. It hardly looks auld-lang-syne. Most women like knowing they can put their investment where they can see it. Wearing a dress made out of gold certificates would look more than a bit tacky. but Now It Just Got Better! One of the 10 reasons to invest in gold jewelry is because of the price of gold. The real price of gold, according to James Turk, founder of GoldMoney, if you were to invest in gold at its' then present price of $900 today, in October 2015 it's now over $1137 per ounce. (Click here for current gold price ) - opens a new window. This is why it's important to ensure your gold jewelry valuation is current and reflects today's gold prices. The point is, it's still relatively undervalued, which basically means it's a good time to be buying gold before it goes over the roof headed towards the moon. Gold is still a long way from the purchasing power an ounce of gold achieved in January 1980. So, if gold in the future were to reach a $6,255 gold price, (this is not impossible) the inflation between now and then would require gold to reach an even higher price to equal the purchasing power it had back in January 1980. There's been a big game changer, between buying and selling antique gold jewelry before the 21st century and investing in old gold jewelry today - it's the internet. The internet has changed the rules of trading forever. Because of the huge impact the internet has had on investing in general, we decided to include the power of the internet as one of the top 10 reasons to invest in gold. Antique Jewelry Investors can now securely buy jewelry online from reputable dealers they trust, and they need not leave the comfort of their homes. In the past, buying and selling Antique jewelry was conducted mostly in private. If you can afford to invest in Antique Gold Jewelry there hasn't been a better time to start collecting. As to how much Antique Gold Jewelry you should buy? That's an easy one, as much as you can possibly lay your hands on. "Is Your Gold Really There?" Buy, Sell or Trade Jewelry At the Jewelry Exchange!